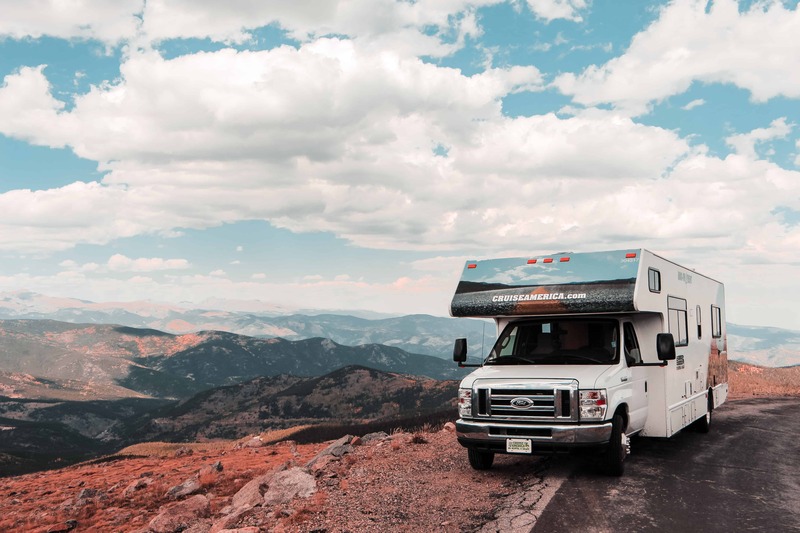 A lot of us have the dream of touring around the country in a motorhome or spending weekends escaping the city for a great cup of coffee in the mountains in your 5th wheel. What would make this dream even better? If you didn’t have to pay for the rig! This may sound too good to be true, but there are lots of opportunities to get a motorhome or travel trailer completely free! Every year several manufacturers, RV dealerships, and outdoor brands run contests where a somebody walks away with a brand new RV! In this post we will walk you through how to find legitimate giveaways to sign up for and how to keep yourself safe from scams that sometimes happen. Why Do Some People Fake Giveaways? 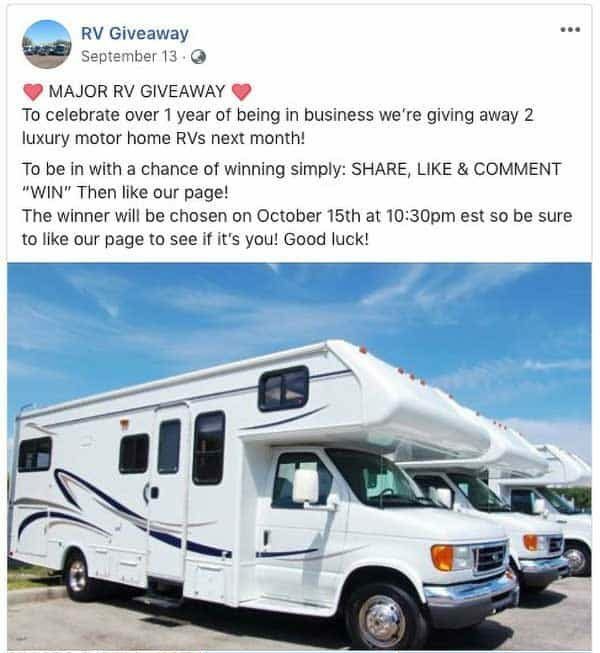 Before we go over how to find and improve your chances of winning a new RV, let’s go over how to identify fake contests. Most commonly you will find these scams on Facebook, where these Facebook Pages are trying to grow their following very quickly but don’t want to pay any money. So they run a fake giveaway to get gullible users to like, comment, and share there page in order to greatly increase there visibility. After they have gotten you for this scam they will then target you in the future for further scams. To help prevent you from getting scammed by a fake RV contest we have put together a checklist to help you identify them. No url listed for the website: A big sign that it is a scam is if they do not have the company website on the page. If they do have a website check to make sure it is the correct one. No phone number listed: Just like the last tip, usually scammers will not go through the effort of setting up the page with the correct telephone number. A simple Google search will help you tell if it is real. No Posts Other Than The Giveaway: If the only posts on the page are for the giveaway do not share it. This is an obvious scam that they try to do over and over again. A real Facebook page would have other posts. Low engagement: If they do have other posts check to see if they have comments and likes. They don’t need to have a lot of engagement just checking to see if they are a real brand. As we discussed there are lots of legitimate giveaways every year. You can find them on Facebook or go directly to the sites of brands that you know and trust. 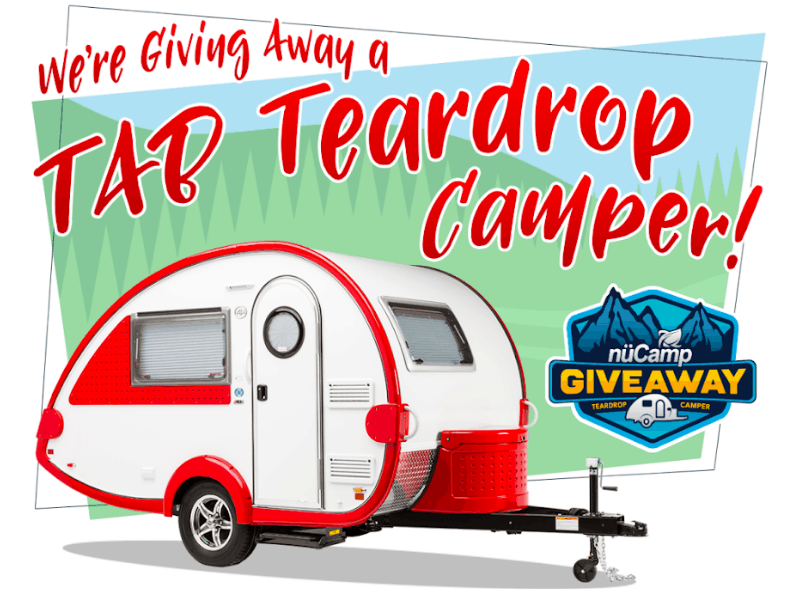 Here are a few examples of where you can go to find RV Giveaways going on right now! Too lazy to look for contests to enter on a daily basis? Me too haha. You can actually set up an alert with Google that will email you whenever a new RV contest comes up. Sometimes it comes down to simple math. The more contest you enter the more chances you have to win. With many of these contests not costing you money, the benefits can be massive. If you are going to be doing this a lot I suggest setting up accounts specifically for contests. Having an email separate from your personal or business email account will save you from a lot of spam. Also, a lot of these contests give you extra entries if you share it on social accounts. Spamming your Facebook account with lots of contests is a good way to lose friends so maybe opt for setting up separate social accounts for giveaways if you are doing it a lot. A lot of these giveaways ask for the same information over and over. It can get extremely boring and take up a lot of time writing your Name, Email, Address, etc each time. Instead, use a free form filler like Robo Form to take care of all of that work for you giving you back lots of precious time and cuts down on the chance of you mistyping your email address and forfeiting a prize. Every contest is different but some of them request you do something more than submit your email address. Some of them want photos or even writing an essay. If you do something like write an essay and it doesn’t win. Make sure to save it so you can use it on another contest. By following these tips you will be able to avoid being scammed while increases the chances that you will actually win a brand new motorhome! Best of luck! If you have any additional ideas on how to improve your chances of winning please let us know in the comments!! Some recommended products may use affiliate links. RVingReviews.com is a participant in the Amazon Services LLC Associates Program, an affiliate advertising program designed to provide a means for sites to earn advertising fees by advertising and linking to Amazon.com. Amazon and the Amazon logo are trademarks of Amazon.com, Inc or its affiliates. Copyright © 2018 RVing Reviews | All Rights Reserved.